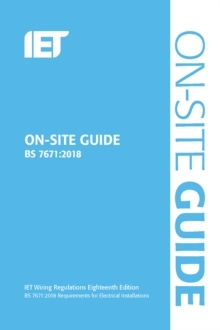 The On-Site Guide is an essential guide to BS 7671. It incorporates the extensive changes in BS 7671:2018, making this a vital guide for keeping up to date. It enables the competent electrician to deal with installations (up to 100 A, 3-phase) providing essential information in a convenient, easy-to-use format. The 18th Edition IET Wiring Regulations publishes in July 2018 and comes into effect on 1st January 2019. All new installations from this point must comply with BS 7671:2018.